On September 2nd, Party General Secretary Nguyen Phu Trong visited an exhibition on Vietnam’s socio-economic achievements. 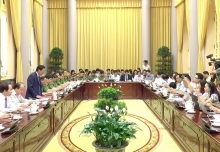 The party leader was accompanied by Minister of Public Security Tran Dai Quang and leaders of some other ministries, sectors, and localities. 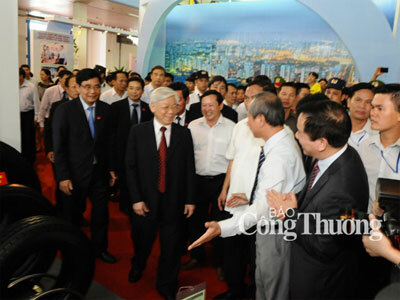 Party General Secretary Nguyen Phu Trong visited many booths of ministries, cities and provinces such as the Ministry of Industry and Trade (MoIT), Ministry of Planning and Investment, Ministry of Construction, Vietnam Television, Vietnam News Agency, and Ninh Binh and Ha Giang provinces. With participation of 28 ministries and ministry-level agencies, centrally-governed organisations, 30 cities and provinces, and 28 booths of businesses, the exhibition was held to show off Vietnam’s socioeconomic achievements over the last 70 years. The Party General Secretary showed great interest in valuable documents and objects that reminded visitors of significant milestones in Vietnam’s history as well as the country’s socioeconomic achievements over the last 70 years. Some ministers introduced the Party General Secretary about achievements obtained by their sectors. At the booth of the Ministry of Industry and Trade, Party General Secretary Nguyen Phu Trong was pleased to see Moit’s great achievements. He was impressed by highlights of the industry and trade sector such as active integration into the global economy, high export growth, new progress in the industrial sector; good effects of the Buy Vietnamese Goods campaign, especially strong increases in sales of Vietnamese goods in mountainous and remote areas, and drastic and effective measures to combat counterfeiting and fraudulent trade.